This Republic Day witnessed history of sorts when Telugu girl Lieutenant Bhavana Kasturi became the first woman officer to lead abn all men Army Contingent in the parage. Bhavana led the Army Services Corps contingent showcasing proudly the woman power of India. 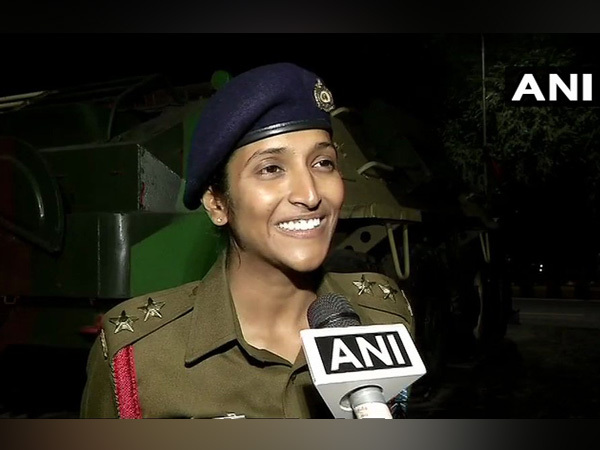 Similarly Major Khushboo Kanwar became the first to lead an all woman contigent of Assam Rifles and Captain Shikha Surbhi of Army Signals Corps stunned all by performing a standing salute on a moving motorbike. Bhavana speaking to scribes shared her love for Telugu heroes Victory Venkatesh, Mega Star Chiranjeevi and also cricketer Rahul Dravid. Bhavana who is a trained Kuchipudi dancer, classical singer and national-level basketball player raving about Chiranjeevi said, “Who can forget his film Jagadeka Veerudu Athiloka Sundari. Chiranjeevi's dance in the movie was fantastic and Sridevi was so beautiful". She says she likes Venkatesh and points out that even his daughter's name is Bhavana. She said she cannot be as calm as Rahul Dravid. She said she loves Baahubali The Beginning, the only move she could watch due to her busy schedule. She said she loved Hot Hunk Rana's acting. Bhavana is married to Captain Dheeraj who was her childhood friend before they became life partners.